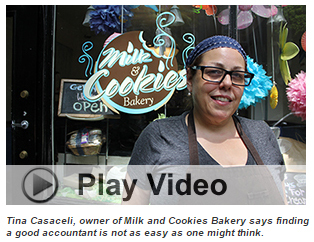 Tina Casaceli, proprietor of Milk and Cookies Bakery located in New York’s West Village, says finding a good accountant is not as easy as one might think. Dissatisfied with the lack of service she was experiencing with her old accountant, Casaceli took her search for a new accountant to the Internet which led her to GoodAccountants.com, the nation’s fastest growing online accountancy referral service. According to Casaceli, she was immediately matched by GoodAccountants with a great accountant whom she now trusts with her life. Business owners like everyone else in today’s digital milieu, are using the Internet for everything from placing help wanted ads, purchasing airline tickets to booking a hotel room. As technology increasingly dominates our lives, it also diminishes the level of human to human interaction we experience each day. No one asks for directions anymore, instead they rely on their vehicle’s navigational system when traveling to an unfamiliar destination. Similarly, business owners are no longer relying on existing relationships to identify their B2B partners but instead are using online search and social media to make these choices, which includes the selection of their accountant. “The idea that word of mouth is still a viable way to build an accounting practice is as unrealistic a proposition as expecting a sixteen year old to use a telephone book,” says Johanna Laurent, President of GoodAccountants.com. “Today, the Internet dominates every aspect of the way we run our business and there’s just no getting around it,” she adds. “Business owners are comfortable using it to find whatever it is they’re looking for just like the rest of us,” explains Laurent. Monique Tatum, the owner of a New York City based public relations firm says she experienced so much difficulty finding an accountant on her own she decided to go online to search for one. She successfully retained the services of Better Accounting Services for $25,000 a year, after a Google search led her to GoodAccountants.com, where she was matched with the Brooklyn, New York based accountants. Sohin Shah, the Co-founder and Chief Operating Officer of IFunding, a web based, real estate, cloud funding platform, recently retained his bookkeeper from GoodAccountants.com for an annual fee of $24,900. The fact is, business owners are no longer relying on ‘word-of-mouth’ to find their most trusted advisers but instead are relying on Internet search and social media to make these choices. “If you’re growing an accounting practice today or any other professional services business you have to be connected to the Internet in a very big way in order to benefit from the technology that is now all around us,” says Laurent. “We are the industry leader providing the best possible platform for accountants who are looking to grow in today’s digital world,” she adds.